Create a wooden look with the Metal Woodprint Linear ceiling. The 80B, 130B, 30BD and the new 30BXD ceiling panels, a natural ambiance can be created with the woodprints. With a range of various wood designs, a light weight, cost efficient wooden ceiling can now easily be made . The key feature of this system is the combination of different panel depths and widths, using the Box (B), Deep Box (BD) and Extra Deep Box (BXD) panels in one ceiling. The benefit of maximum flexibility in design. The Multi Panel ceiling system is suitable for all building sectors: Corporate, Transport (airports, metro-, bus -, train stations), Retail, Leisure, Public space, Hospitality, Healthcare, Education or Residential. The panels are available in three widths of 30, 80 and 130 mm, and various heights, which can be fixed on one carrier. This unique pairing of ceiling panels makes it possible to design highly functional and beautifully engineered three-dimensional designs. The 20 mm joints can be left open or sealed, plus you can also integrate our special lighting solution Luxalon® Light Lines to add additional functionality and enhance the ceiling design. The Metal Woodprint ceilings are standard available in five woodprint finishes, Palisander, Pine, Cedar, Oak and Birch. For availability information per ceiling type you can contact the sales office. Special finishes and colours for projects are available upon request. New extra deep, acoustic Ceiling Panels with outstanding sound absorption and design capabilities, to create the wooden effect, with the benefit of metal. The robust look of the Multi Panel Ceiling System fits perfectly in large open spaces with a high level of noise like in airports, shopping malls or conference halls. With excellent sound control properties, Multi-Panel BXD Ceiling Panels turn loud environments into spaces with a comfortable acoustic ambiance. In addition, the Luxalon® Multi Panel ceiling offers unique design possibilities and great challenges for incorporation in the building design. Here you can find information about: Maximum spans, dimension & weights, material requirement per M2. 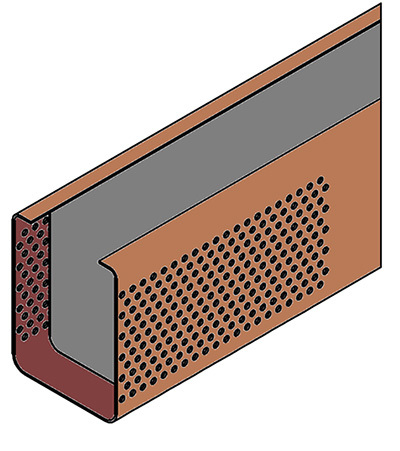 In order to achieve a high acoustical performance, a special 1.5mm side perforation has been developed for the 30BD panel. This perforation leaves the visible side of the 30BD panel uninterrupted, while at the same time provides remarkable acoustics. Inside the panel, a non woven acoustic fleece is added to increase the acoustical performance. The acoustic comfort in an office space, school or public building contributes to our well-being as poor acoustic comfort can affect health, communication, safety, productivity and learning. Using Hunter Douglas high performance acoustical ceiling products are the best solution to deliver outstanding acoustic performance, comfort and an aesthetic pleasing solution. With the Luxalon Multi Panel system absorption values (Aw)between 0.55 and 0.85 can be obtained, depending on the ceiling and panel configuration.